I don't know why, but I hardly ever think about making regular brownies. 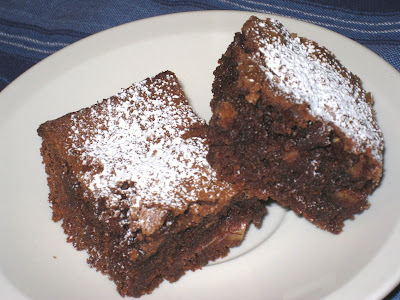 I make graham cracker brownies on a regular basis, especially around the holidays. They're easy to make and they always get rave reviews. Regular brownies seem kind of ho-hum in comparison, and more of an effort to make. But I've had some unsweetened baking chocolate around for what seems like forever, and decided it was time to start using it up. I wasn't sure how I wanted to use it, so I looked for some recipes. And kept coming back to brownies. I have a recipe that's been in the family for years. I think the reason it always seemed like such a hassle to make them was that you had to melt the chocolate over a double boiler, and that always seemed like it was more trouble than it was worth. But melting chocolate is a cinch in the microwave. I just zap it for 10 second intervals, stirring in between, and take it out when most of the chocolate has melted and let the residual heat take care of the rest. And just like that, it's done. I'm always surprised at how good these brownies are. They're not loaded with three different kinds of chocolate, and they're not frosted. They don't look like much when they come out of the oven. But they're everything a brownie should be. Moist and chewy, and full of rich chocolate-y goodness. Now that I've rediscovered them, I expect to be making them more often. And they aren't terribly expensive to make, even with the higher quality flour and butter that I am still able to use. The chocolate was Nestle's because it's what I had on hand. Melt chocolate in the microwave by placing in a small bowl and cooking it on high for 10-second intervals, stirring after each interval. Remove when most of the chocolate has melted and let the residual heat melt the rest. Or, melt the chocolate over a double boiler on the stove. Sift flour, baking powder, salt into a bowl. Beat the sugar into the eggs. Add the oil, chocolate, and vanilla and mix well. Add the flour mixture and stir until just blended. Add nuts. Turn into buttered 7 x 11-inch pan. Bake for 20 minutes, until a toothpick inserted into the middle of the pan comes out clean. Cool for 5 minutes, then turn out of the pan. Cut into 2-inch squares. Dust with powdered sugar (optional).